Pin your frequently used office 2007 documents in Recent documents list.There may be few set of office 2007 documents, that you may use regularly. The easiest way to open them is from the Recent Documents list. The number of documents (file handles) to display in the recent documents list can be configured in office 2007. Your document is now pinned to the Recent Documents list. 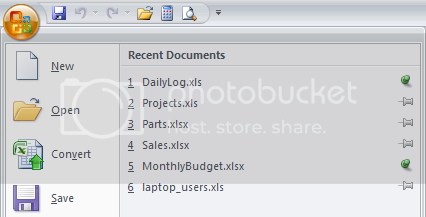 “Recent documents” in office 2007: How to set the number of “Recent documents” to display or show?